1099-R Forms: Distributions from Pensions, Annuities, Retirement, etc. 1096 Forms: Annual Summary and Transmittal of U.S. Information Returns. 1099-A Forms: Acquisition or Abandonment of Secured Property. 1099-B Forms: Proceeds From Broker and Barter Exchange Transactions. 1099-C Forms: Cancellation of Debt. 1099-PATR Forms: Taxable Distributions Received From Cooperatives. 1099-OID Forms: Original Issue Discount. 1099-S Forms: Proceeds From Real Estate Transactions. 1098 Forms: Mortgage Interest Statement. 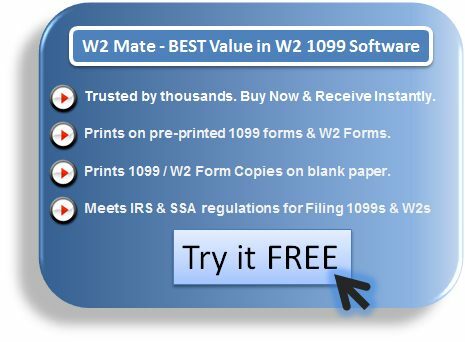 W2 Mate prints all recipient copies on regular white paper and prints data on the pre-printed government-approved forms. For 1099-MISC forms, W2 Mate generates password-protected, read-to-email PDF 1099 MISC forms. This eliminates the need to buy, print or mail IRS 1099-MISC forms. W2 Mate imports 1099 data from Intuit QuickBooks, Sage Peachtree, Sage DacEasy, Microsoft Dynamics and Great Plains. W2 Mate also imports data from spreadsheets. Printable 1099 forms created by our 1099 software comply with IRS publications for substitute 1099 forms (Publication 1179 General Rules and Specifications for Substitute Forms 1096, 1098, 1099, 5498, W-2G, and 1042-S).